Earlier this week Watpac announced that it was successful in winning a $110 million contract to design and build the new Deakin Law School building at the Burwood Campus. 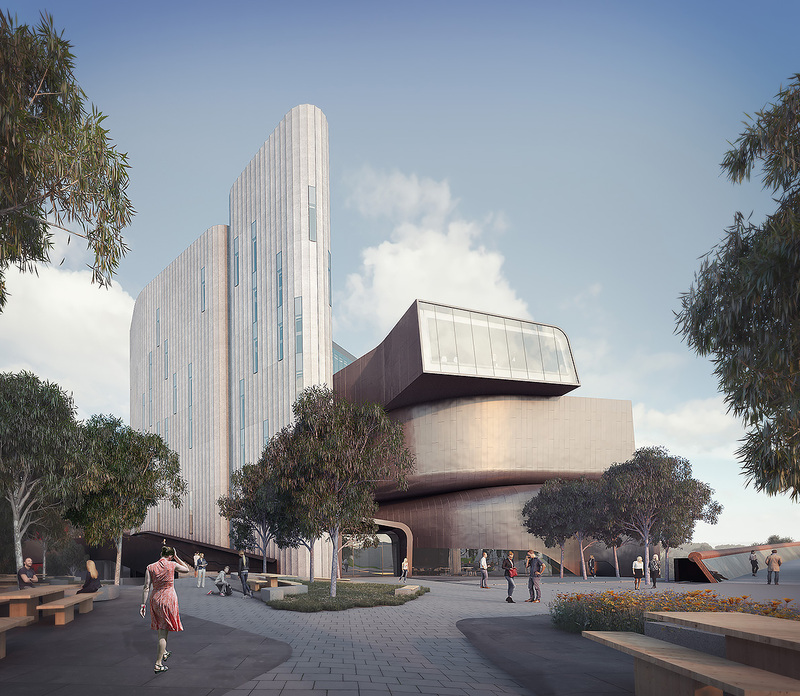 The nine level building, designed by Woods Bagot will comprise 20,000 sqm of teaching and learning spaces, student support and wellbeing spaces, staff workspaces and basement car parking. The Law School building will provide a hub for meeting, learning, networking, student wellbeing and student services that caters to the needs of next generation learners beyond the classroom. This holistic approach is intended to create a vibrant and engaging interactive campus for students. Additionally, other innovative features have been incorporated into the design with spaces that facilitate and encourage interactive modern learning and enhance the overall student experience. According to Watpac, the company is looking forward to delivering its first project for Deakin University, while this continues Woods Bagot's relationship with the University at its Burwood Campus. The firm has previously designed the Burwood Highway Frontage Building which accommodates the Faculty of Health, and Deakin University Building I which connects two existing theatres and provides internal and external gathering spaces for students. The contract builds on Watpac's national pipeline of projects which includes specialised university buildings including Port Macquarie’s Charles Sturt University Campus and the University of New South Wales Joint Health Education Facility. Watpac anticipates site works to commence on the Law School building by the end of the month, and says its project team is well-placed to deliver a leading education facility for Deakin University. Watpac understands the specific requirements of creating modern learning environments that embrace the changing way students engage with learning and we are excited to work with our new client in delivering this innovative building. The Group has the desirable combination of education sector and sustainability experience having delivered almost $1 billion of education infrastructure since 2016 underpinned by our commitment to environmentally sustainable design and building practices. Thanks to our integrated approach to design and construction, and our diverse experience in the education sector, this state-of-the-art facility will provide Deakin with an exceptional learning space for years to come. We anticipate peak workforce numbers to reach 230 people and estimate the project will be completed by mid-2020.